Disclaimer: The Conclusion given at the end has been given in a completely non-professional capacity. Though the Guidance has been given to the best of my abilities we cannot be held liable in any way whatsoever. Nvidia’s (NASDAQ: NVDA) second quarter fiscal results are out and an Earning Per Share (GAAP Diluted) of $0.22 has been reported. This beats analyst expectations and marks healthy growth for the company. The dividend is expected to be paid on September 12, 2014 for all the stock holders on record by August 12, 2014. Nvidia (NASDAQ:NVDA) is currently trading for 19 dollars on NASDAQ after a short buy in spike. In our previous forecast we reported that the chip maker will have to step up their game since Maxwell on the 20nm node isn’t expected anytime soon. 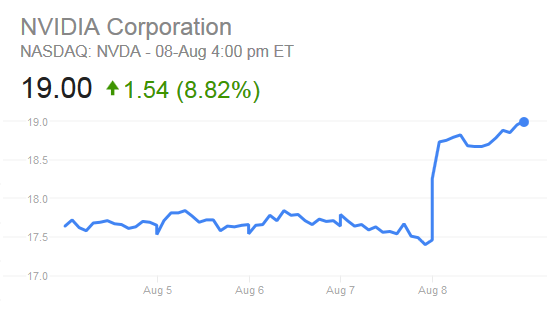 It would appear that Nvidia (NASDAQ:NVDA) has done just that in their Tegra business. With a massive revenue increase of 200%, the Tegra K1 sales are largely attributed to Green shifting focus from the smartphone Industry to other ‘mobile’ concepts such as vehicles and SHIELD Tablet. The BMW and Audi design wins also account for the spotlight Tegra saw at the Earnings Call. The GPU business has declined by 2% but this is mostly in conjunction with the overall trend and seasonality of the market, since next generation products are not currently in the market. Going on a strictly yearly basis we have seen strong growth of the company and a generally positive regression over the years. Nvidia (NASDAQ:NVDA) has also ventured further into the Professional market with the first ever GPU Accelerated support for Adobe Illustrator CC which will result in Professionals giving preference to Nvidia cards over alternatives. Revenue in Q2 FY15 was 1.103 Billion Dollars. Revenue has been completely flat since last quarter (Q1 FY15) and has gone up 13% Year by Year (Q2 FY14). The effects of Seasonality were counteracted by Tegra’s growth resulting in a flat revenue Q/Q and healthy growth Y/Y. Gross Margin: Nvidia (NASDAQ:NVDA) had a gross margin of 56.1% this Quarter. This has gone up 130 Basis Points Quarter over Quarter. The Gross margin of Q2 FY14 was 55.8% and has gone up 30 BPS. Net Income: Net Income this Quarter was $128 Million Dollars. This has gone down 6% since last quarter (Q1 FY15) and gone up 33% Year Over Year. After accounting for seasonality we see a bullish trend in the Y/Y increase in Net Income. Operating Expenses: Q2 FY15 saw operating expenses worth 456 Million Dollars for Nvidia (NASDAQ:NVDA). This has gone up 1% Q/Q and and up 4% Year over Year. Gross Margin: Nvidia (NASDAQ:NVDA) had a gross margin of 56.4% this Quarter. This has gone up 130 Basis Points Quarter over Quarter. The Gross margin of Q2 FY14 was 56.3% and has gone up 10 BPS Yearly. Net Income: Net Income this Quarter was 173 Million Dollars. This has gone up 4% since last quarter (Q1 FY15) and gone up 30% Year Over Year. Operating Expenses: Q2 FY15 had operating expenses worth 411 Million Dollars for Nvidia (NASDAQ:NVDA). This is up 3% from last Quarter and up 30% Year over Year. Small Growth in revenue is expected from Nvidia (NASDAQ:NVDA) and the company should remain profitable through the next quarter. This quarter is a good time to buy in early on and hold stock because a very good Fourth Quarter is expected with the sales of 28nm Maxwell and Geforce 800 GPU Lineup. The Nasdaq rating is at hold stock with tilt to buy. Nvidia Corporation’s Ethical Pricing Problem – Monopolistic Price Skimming or Fair Value? NVIDIA Corp. (NVDA) Fourth Quarter Earnings Could Fall Short of Expectation – Can Tegra K1 Save the Day?